Ladies and gentlemen, meet the new HD Nexus 7. Google unveiled the second generation of its signature 7-inch tablet at an event in San Francisco today, and it's definitely a device worth your notice. How exactly does the new Nexus 7 compare with the previous generation of the tablet? The HD Nexus 7 doesn’t look much different visually from its predecessor, but it’s more powerful all around. Before you even power up the device, you’ll notice that this one is slightly thinner and weighs less than the original. With more RAM and a better processor, you’ll notice the newer tablet faster, too. But the real draw here is the Nexus 7’s new 1920x1200, 7-inch HD display. That richness absolutely blows the resolution of the current iPad mini out of the water. Looking under the hood, the tablet comes with a 1.5GHz Snapdragon S4 processor, 2GB of RAM, 802.11 a/b/g/n WiFi, NFC, Bluetooth 4.0, and HDMI output for directly connecting the device to a monitor or television. The battery should last you 9 to 10 hours on a single charge, so you can definitely count on the Nexus 7 to keep kids entertained during long trips. (Don't worry, the additional parental controls featured in AndroidJelly Bean 4.3 will make sure they stay out of trouble.) The tablet also comes with a standard 5.0MP rear-facing camera, along with a 1.2MP front-facing one. All your basics are definitely covered. The new Nexus 7 will also come preloaded with the latest version of the Android operating system, Android 4.3 Jelly Bean, which has a few key upgrades. First, multi-user profiles can now be configured with restricted profiles so you can determine the type of content and apps loaded per profile. 4.3 Jelly Bean also supports Bluetooth Smart technology, which lets you connect to low-power Bluetooth devices like heart rate monitors. Finally, for gamers, the new OS will support Open GL ES 3.0, which makes the tablet better at displaying graphics. With the tablet market increasingly crowded with competitors (some cheap enough to be sold at drug and convenience stores), you can’t just trust the Android name alone. 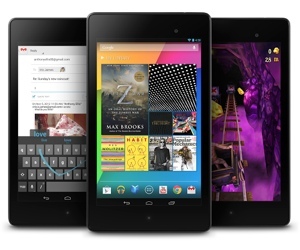 But you can trust the Google name – the Nexus 7 is a solid device at a terrific price point. And it seems like I’m not the only one who thinks so: Google sold out on pre-orders for the device almost immediately after it was announced. The new HD Nexus 7 will be available in 16GB WiFi-only ($229.99), 32GB WiFi-only ($269.99) and 32GB unlocked 4G LTE ($349.99). It goes on sale in the U.S. starting July 30.